It has been 40 years since a family acquaintance, Bill Shroeder, and 3 others were killed at Kent State University just down the road from where I was growing up. Up until then I had been effectively shielded from the Vietnam War but Schroeder's death from shots fired by the Ohio National Guard while he was walking to class forever changed that. With 2 unpopular and seemingly endless conflicts currently taking the lives of our young men 1000's of miles away, many continue to wonder why we didn't learn from Vietnam. 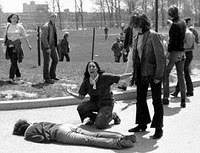 For the 100's on the campus of Kent State on May 4th 1970 though, it is a lesson that they will never forget. In remembrance of the incident also know as the "Kent State Massacre", Neil Young wrote Ohio.